Pre-Songkran the municipality used water trucks to spray the air in an attempt to reduce the haze. While this may be a commendable idea, I am not sure how effective it is. But I am sure how dangerous it is for motorists, creating hazardous conditions for everyone on the road. It is especially dangerous for those on motorbikes as the roads become wet and slick with oil and water. Not only that but visibility is reduced, not just for motorbike riders but for motorists too. An added hazard comes from motorbike drivers cutting through traffic to avoid the spray. Really, I would think given the hazards and the amount of dust removed it would not really be worth the effort. From early 1963 to late 1965 I was stationed with the U.S. Army - 5thRRU, in Chiang Mai and later, Bangkok. Looking back, from age 70, I must say that I have never in my life enjoyed myself more than the time I spent in Thailand. The country and its people were a joy. I have been to 16 different countries, working or simply travel, since then, and none equal Thailand. You can be proud of your city and your country. Maybe one day I’ll be back. Thank you for the interesting opinion on Chinese tourists but really, I must wonder aloud each time I see one stopped in the middle of the street taking photos or looking at a map. Surely they would never stand in the middle of the street back in China! I imagine with their traffic that would be a sure fire way to get run over! It is not only me but many of my friends that have seen this behavior, stopping in the middle of the street to check their maps! One friend of mine said he was driving his scooter down the street when there was a Chinese girl standing in the road looking at her map. Having nowhere to go he tooted his horn at her, thinking she would move out of the road. He told me she just stood there like she was standing on the pavements! He had to brake to avoid hitting her and then swerve into traffic to go around. What could she possibly be thinking? Perhaps the Chinese government needs to issue some kind of pamphlet on traffic safety in all these flights that are now coming to Thailand? One of these days one of these tourists is going to get killed. Following my letter about the wonders of social welfare (thanks for printing it), a fellow farang aged over 60 passes on 2 important warnings. The Thai ‘system’ expects everyone to retire at 60, so if you are still in employment after that age, with a work permit, you must pay your own social welfare payments because you employer is not allowed to do so. Secondly, he has just discovered (to his dismay) that if you change employers after the age of 60 you are excluded from the system completely. No more social welfare at all, whether you offer to pay direct or not. This seems totally unfair, but since when was life fair? Please see my two photos. 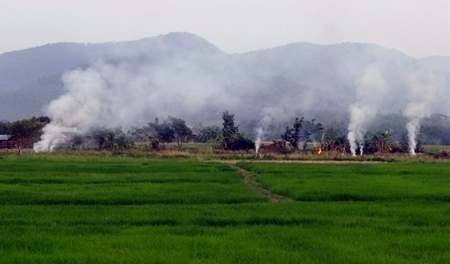 The fires you see are set less than a few hundred metres from the Doi Saket Municipal Office. 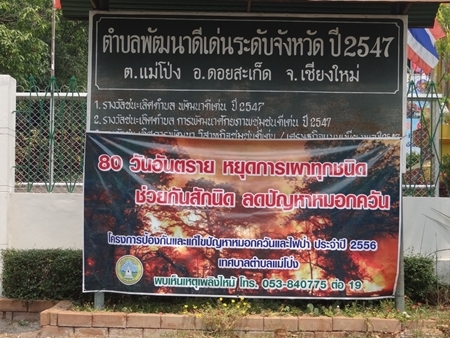 Indeed, the fires are a few hundred meters from the Doi Saket Municipal Office “No Burning” sign! Good to see the ‘clamp-down’ on burning is so successful! Chinese tourists stop in the street!